As you age, your eyes will go through various phases in life. One of the most drastic of the vision transitions today is for middle-aged people. Difficulty with reading vision rapidly declines after age 40. People often get worried when they go through this transition, especially if they have had excellent vision all of their life. The problem is even worse for nearsighted people as they make this transition. Not only will they continue to have pre-existing refractive errors, such as nearsightedness, farsightedness and astigmatism, but now they will also develop presbyopia as well. Presbyopia is the inability to read or see closely through your normal distance correction. This occurs because the lens looses its ability to change shape or accommodate to focus near objects. Up until most recently, presbyopia had been treated with bi-focal lenses. With advances in modern ophthalmic technology we can now help patients turn back the clock with reading or distance vision problems. Since the topic of discussion has to do with the inability to read or focus on close objects we will explain a revolutionary near vision refractive correction technique that could help you see better. 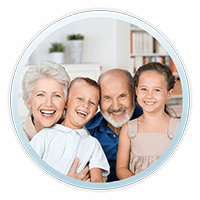 If you have experienced an age-related decline in near vision, a solution is available with a procedure called NearVision CK®. In 2004 the U.S. Food and Drug Administration (FDA) approved NearVision CK® for the treatment of presbyopia. 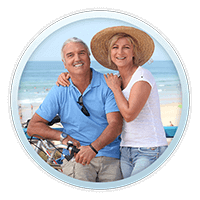 Candidates for NearVision CK® are typically over 40-45 years of age and have been struggling with reading glasses. Simple activities like reading menus or signing credit card receipts become an issue that requires reading glasses. NearVision CK® is a promising option for patients with farsightedness or presbyopia. This is a revolutionary vision correction procedure that uses radiofrequency (RF) waves instead of a laser to reshape the contours of your eye. By changing the way your cornea directs light to the rest of your eye CK effectively treats the conditions known as hyperopia or presbyopia. CK involves no cutting of the eye. NearVision CK® uses very accurate pulses of radiofrequency waves to reshape and steepen corneal tissue centrally, resulting in improved vision, especially for reading. 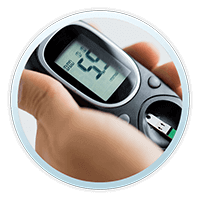 Radio frequency is one of the modern medical world’s most advanced surgical technologies. It is routinely used in other procedures such as prostate cancer therapy, orthopedic surgery, and cardiovascular procedures. What happens during the NearVision CK® procedure? The NearVison CK® procedure is performed using a small probe, thinner than a strand of human hair, that releases radiofrequency (RF) energy. Instead of a scalpel or a laser, CK releases radiofrequency energy through a probe as thin as a strand of human hair, without cutting or removing tissue. After application of a topical anesthetic, radiofrequency energy is applied in a circular pattern to shrink small areas of corneal tissue. This circular shrinkage pattern creates a constrictive band (like the tightening of a belt), increasing the overall curvature of the cornea. The result is somewhat like wearing a bifocal contact lens. The entire procedure takes about three minutes, and most patients report immediate positive results after NearVision CK®. After this type of eye surgery, there may be some mild discomfort, which can be alleviated with drops or analgesics. Shortly after having the NearVision CK® procedure patients will have better ability to focus on near objects without any drastic effect on distance vision. Patients should be advised that complete vision correction may take several weeks to manifest itself. Patients who use reading glasses. Patients who are over 40-45 years old. Patients who have not undergone other refractive surgeries. Patients who have difficulty with reading glasses. Patients who have healthy vision with exception to reading problems. 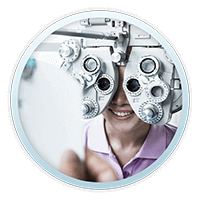 If you think you might be a candidate for NearVision CK® please feel free to take our NearVision CK® Self-Evaluation TEST. The actual procedure uses controlled radiofrequency waves (RF technology), instead of lasers or a blade, to change the shape of the cornea and bring close vision back into focus. 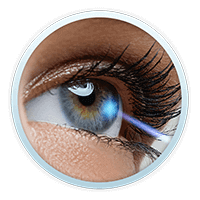 NearVision® CK is laser-free and extremely safe: There is no cutting and no removal of tissue, however the procedure is not reversible. 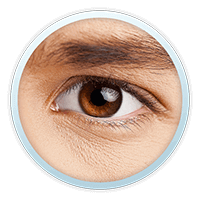 NearVision® CK is a painless procedure. Complete visual recovery occurs in a few weeks! More than 90% of patients reporting satisfaction with quality of vision and depth perception. The NearVision® CK procedure was found to be safe and effective, with no adverse events or flap complications and the technology was shown to fulfill all FDA safety limits, and to meet or exceed FDA’s targets for outcome predictability. NearVision® CK or conductive keratoplasty is a safe procedure that can be performed as an outpatient procedure in less than five minutes. As with any type of vision correction, it is very important that candidates for this procedure are carefully examined. It has been reported that some patients experience blurred or impaired vision for the first days after the procedure. Risks are quite rare with this procedure, however; risks are a reality and need to be understood prior to consent. During your vision care consultation Ellis Eye Laser & Medical Center will educate you on all aspects of this procedure so you can make an informed decision. Side effects include halos, overcorrection issues, discomfort on the surface of the eye, and starburst around lights. Issues with over-correction often disappear within the first few weeks. Occasionally, CK may induce astigmatism. However, such astigmatism is usually moderate in extent.